In Thailand, you’ll find countless vendors selling Thai tea on the streets, either from stables street stands and often from mobile motorbike drink carts. Many of the cha yen (Thai iced tea) vendors, use a brand of tea that comes in a red and white bag known as Cha Dra Muer (ชาตรามือ) – or it’s just known as Number One Brand. When I was in the US, at the Asian supermarket, I do remember seeing this same brand of tea, so I believe it is available if you live in a major city with an access to a large Asian supermarket. If not, I think you can make this recipe with any black tea (it just might not have that signature orange color that Thai tea usually has… more on the color below). Yes, I accidentally opened the condensed milk from the bottom. Why is Thai iced tea orange? Why is it so orange? 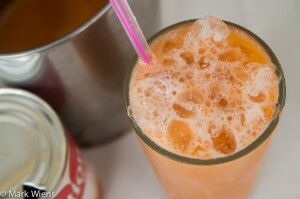 Have you ever wondered why Thai tea has such an incredibly, and overly orange tone to it? After I read the ingredients list on the bag of tea, I discovered that it includes some C Yellow Number 6 (which is apparently the same food dye that was in Kraft Macaroni and Cheese, before it got outlawed). So that’s the secret, it’s not just that it’s really awesome yellow tea, it’s a food dye that they put into the tea leaves (that’s why it’s the same color as Mac and Cheese). I think you could make this Thai iced tea recipe with any kind of black tea, and it might just not have that orange color, but I think it would taste fine. But on the streets of Thailand, or if you go to a Thai restaurant and order iced tea, it will always be the orange color. Thai Iced Tea Recipe (Cha Yen) - Authentic Thai Street Food Style! There are few things on the streets of Thailand more refreshing than a Thai style iced tea. 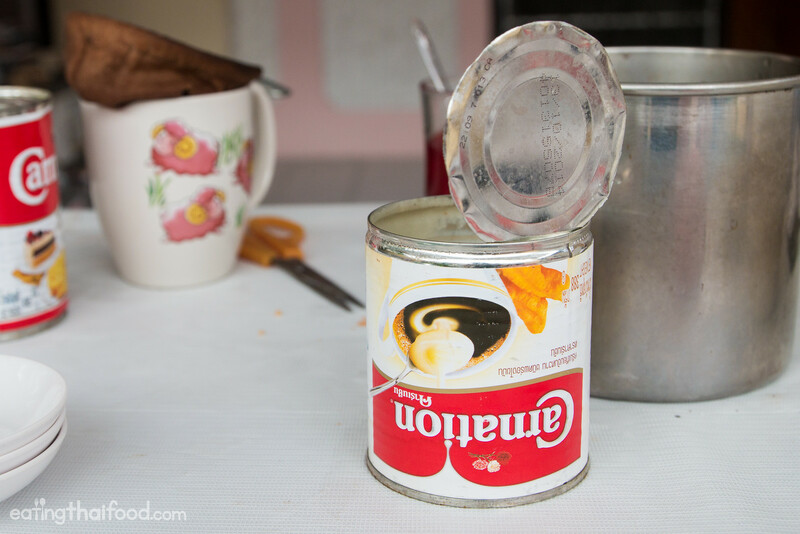 After the tea is brewed, it's mixed with sweetened condensed milk and evaporated milk to make it creamy, rich, and sweet. Cha yen, as it's known in Thai, is famous at Thai restaurants around the world, it makes for a wonderful refreshing beverage. Watch the video recipe here. Take your tea sock and add about 1 tablespoon of black Thai tea. It’s then easiest to put your tea sock into a bowl or big cup in order to steep the tea. Pour 1 cup of boiling water into the tea sock, and push it in and out to steep the tea and extract all that flavr. Steep the tea for a few minutes until it turns nice and dark in color. Optional - A good Thai iced tea should have a little froth or some bubbles on top, so take 2 pitchers, and pour the tea from one to the other, with a bit of elevation. You could do this in a different way too, but it’s pretty fun! Add a straw, and you’re ready to start slurping it down! 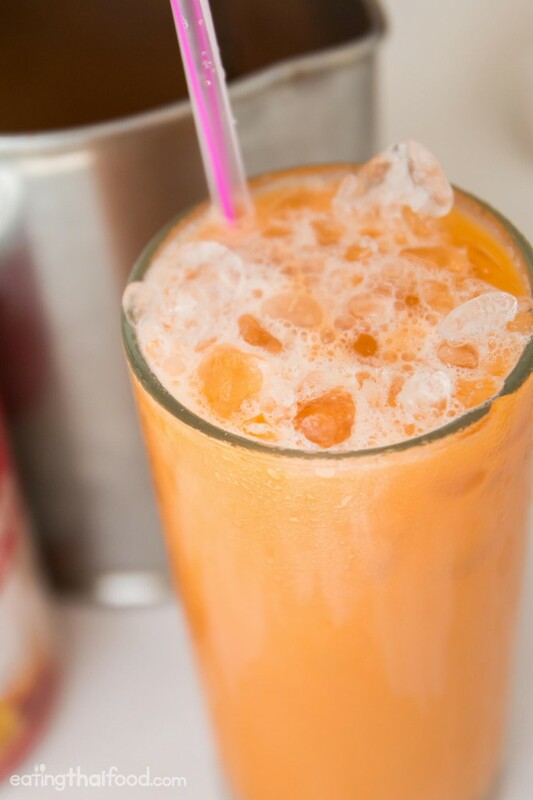 Thai iced tea is a great sweet beverage on a hot day! Enjoy this recipe! See the full recipe here and watch the video here. A really good iced Thai tea should have a little foam and some bubbles on the top, kind of like a cappuccino froth, but not as thick. One way to get those bubbles, and to really stir up the tea with the milk, is to take two big sized cups, and pour the liquid from cup to the other cup, with a little elevation (see my attempt on the video). I did end up spilling a bit of the tea, but it sure was a lot of fun. 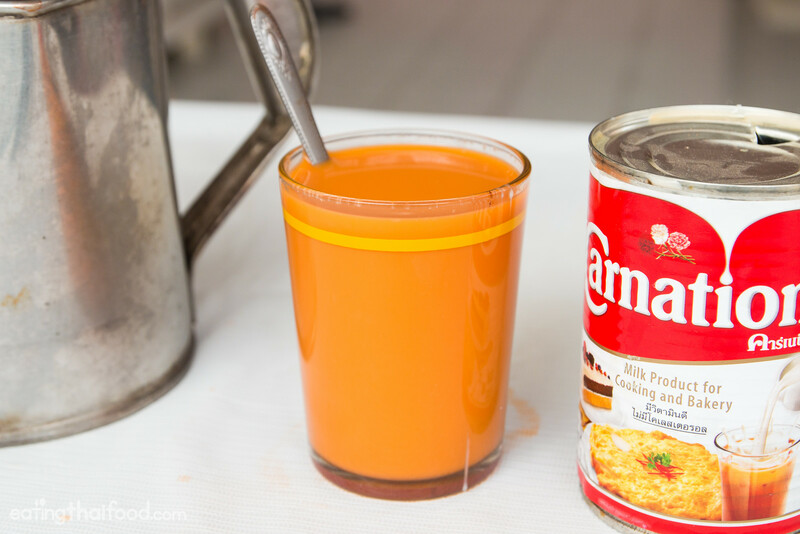 The final step for this Thai iced tea recipe is to drizzle on a little extra evaporated milk on the top of the glass. You’ll see the milk slowly trickle down into the orange tea. Give it a quick stir with your straw, and you’re ready to consume and refresh yourself. One last thing, it would not taste the same if you didn’t use a straw – believe me – I don’t really like straws, but for some reason with Thai milky tea, it just tastes better using a straw. 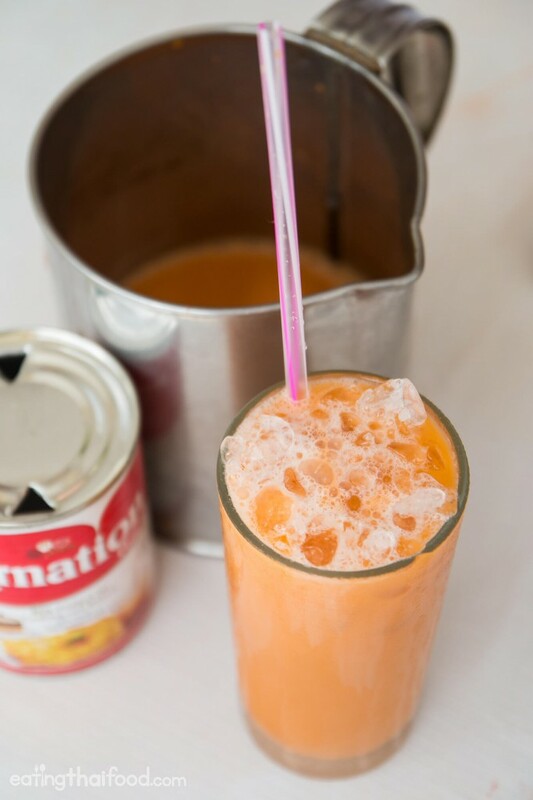 I hope you enjoyed this Thai ice tea recipe. Let me know what you think and how yours turns out in the comments below! Are you interested in more authentic Thai recipes? Check out all my other Thai recipes here. 78 comments. I'd love to hear from you! How many times can you reuse the tea leaves? Great to hear that Yolanda! We love your blog and your videos Mark! This was great! Thank you so much for sharing. The tea came out perfect. Simple to make and tasted great. I just learned how to make this as well as green match latte. My family loves it so we will be making more. Please add a Pinterest link! My device won’t support me having a button from Pinterest to click, so I rely on sites to include it. I can’t wait to get to the market to make this!!! A favorite of ours! A quick search on Amazon for “Cha Dra Muer” yields a 400g bag for under $8 USD (ships free with Prime! ), I’m going to give it a try! How big is the mixing glass cup? How many mls? Delicious! I used my french press (since I don’t have a tea sock) and it came out perfectly. It’s also delicious as a blended beverage (throw everything – including ice – into the vitamix), topped with whipped cream. I had those in Thailand, as well. Thanks for sharing this recipe, Mark! I will surely try this, especially now that it’s summer in Nevada. I will surely try this Thai tea especially summer here in nevada. How do I get the drink orange? Hey Jeneen, in Thailand that coloring is within the tea leaves in that brand. Not so, the ingredients are the same, it’s made in Thailand and all brands like Foco from Thailand have it. That said I’m sure when made fresh it is colored otherwise. That said yellow 6 was not been outlawed, just shunned by food manufacturers. Great to hear that, thanks Luc! Wonderful would love to try this can’t save it have trouble writing. Please send recipe for Thai Iced Tea Recipe. What alcohol would you recommend adding to this? A Thai restaurant near me serves it with rum and it is delicious! Hello, doesn’t it have star anise and can you substitute evaporated milk with coconut milk? And instead of regular sugar can I use stevia? Thank you! Hey Ellie, haha, yah it’s a pretty bright orange. Glad you enjoy cha yen! For the next step of decadence, I have just discovered Thai Iced Tea ice cream at the buffet at Pullman King Power Hotel in Bangkok- the same fabulous colour and taste is sure to please both ice cream lovers and cha yen lovers alike! Hey Kim, thank you very much for sharing, and glad the Thai iced tea turned out so well! It is my understanding that the Thai Food and Drug Administration has banned the use of dye in Thai Tea. Maybe that is why some of the exported bags don’t have the orange color when it is made. But as far as Thailand goes, it is as orange as ever! 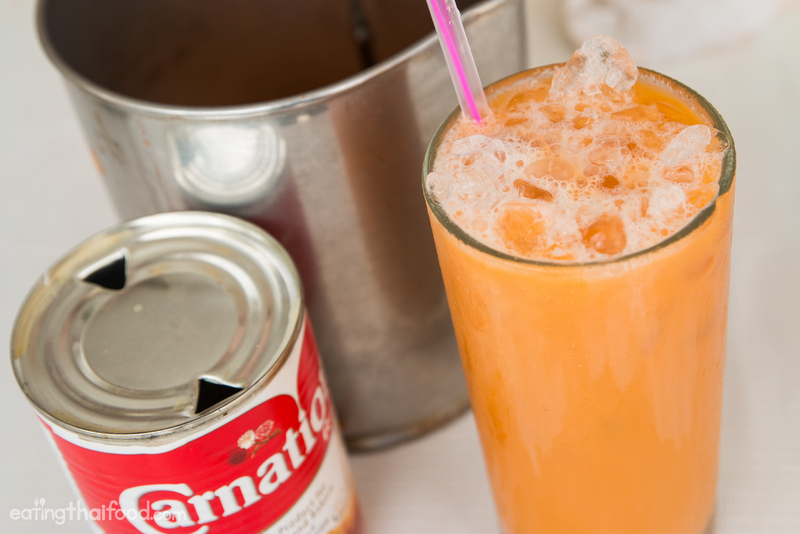 An easy recipe, every Thai Tea lover should be making it. Thanks again! You’re welcome Scott, and thanks for sharing! Hi Sarah, hmm, I think you could make it using the same recipe, just brew the green tea instead of the black / orange tea. Is it powder tea or tea leaves? Hey Arthur, great to hear you made Thai iced tea, glad it turned out so well! Traditionally, turmeric is used. Cood quality tumeric is very orange. The dye is used to give the illusion of good quality. Traditionally was used tamarind seeds, not turmeric (which gives a yellow colour). Colour dye has been used as it is cheaper then the seeds. my daughter is making this for her school’s international fair as she was assigned Thailand. How well does the tea keep after the ingredients are all added? Hi Heather, it would be best to drink pretty quickly after being mixed together, but you could probably keep it in the fridge for a couple days. Hope your daughter’s assignment goes well! I made this using your recipe the other day and it was perfect! Thank you! I have a question unrelated to the tea though, that noodle dish with prawn at the beginning segment of your video…it looks delicious! What is it called and do you have the recipe on your website? Thanks! 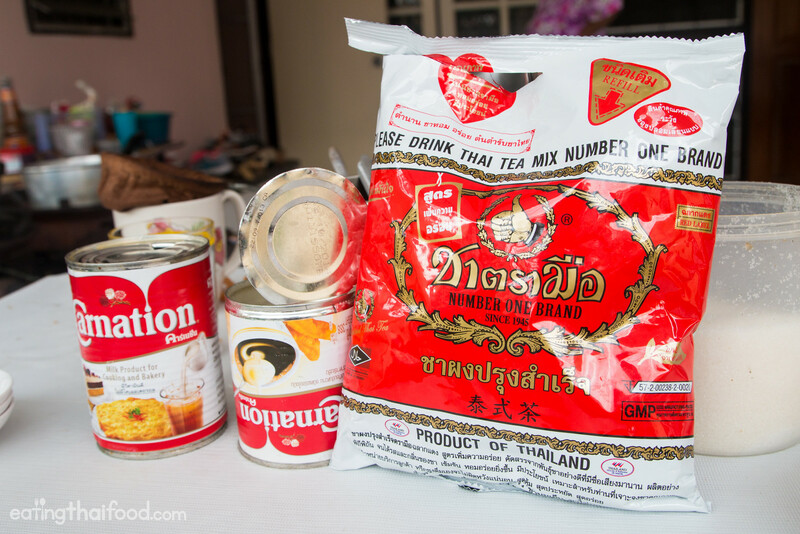 Hi Mark may I know where cannot buy this brand of Thai tea mix in Bangkok? I remember looking for it at Top and afew supermarket but couldn’t find it. Hi Jerra, I’m not sure if they carry them at all supermarkets, but you might try Tesco or Big C. Most of the time I see it at the local markets – like within Khlong Toey market or Phra Khanong Market. Cool. “Sunset Yellow FCF (FD&C Yellow 6) has no carcinogenicity, genotoxicity, or developmental toxicity in the amounts at which it used” according to Wikipedia. Drink up! Love this site. Looks like you’re having a lot of fun. I need to go to Thailand, never been there, but love Thai food. Everything looks so yummy. Sound good, thanks for sharing Jonathan, and hope you can visit Thailand in the future! Hi Mark recently I tried thai food and I love it ☺ I week ago I tried thai tea and we enjoy soo much that we run out the ‘orange’ thai tea on the restaurant. The owner offers us green thai tea and was even better ;) I was seaching for the recipe and I found yours. Do you know if there is specific green tea to do green thai tea? Hi Sofia, great to hear from you, glad you love Thai iced tea! As for the green tea, they normally use a green tea made by the same brand Number One tea Brand. Hope this helps! Ceylon tea is exclusively produced in sri lanka and i think the idea of mixing tea with spices inspired by indian and middle eastern cuisine because they put spices in their tea too. At first i thought the signature orange tone comes from turmeric but when you mentioned it’s from food dye it doesn’t sound healthy to me. Is there any alternative way to make it look orange? Is turmeric powder good? Yah, I agree with you. I think turmeric would make a great substitute. Let me know how it goes! No, tumeric won’t work since it has strong flavor. It’s better for curry dish, beside that, it doesn’t dissolve well in water. Thanks for the recipe! Yes Turmeric won’t work use the Indian spice called Saffron, that’s expensive herb and has got great medicinal value & has orange color to it! Thanks for your sharing :). I hope you will add “kway jab” to Thai street food recipe. It is quite popular n yummy. I love this n have to taste it whenever I travel to BKK. 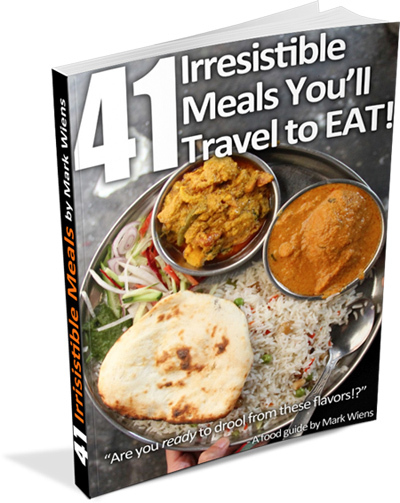 Your sharing becomes my Thai food handbook whenever I leave for The city of Angel. Hi LAN, great to hear from you. Good choice, kuay jab is a wonderful dish. Alright will remember that, maybe I can try out the recipe. I love Thai iced tea! Bizarre that there’s food dye in it, though. Hey Ashley, yah, I guess that’s just been how they’ve done it for so many years. But I think you could make it with just normal black tea and it would taste pretty good too. Great recipe!! I’ve seen them use a lot more than two teaspoons of sugar sometimes which is why I order mine “waan nit noi” (a little sweet). I’m a bit disturbed to learn about the origin of the orange color, but I recently had a cha yen made with black ceylon tea while I was in Ubon and it was the best I’ve ever had! Thank you Rakhal. Haha, yes some make it outrageously sweet. I think the recipe would work well with another type of black tea, minus the yellow coloring.